This week, the arrival of the sun meant shedding the jackets and cardigans and showing a bit more skin. Now, I don't know about you but I feel miles better when I have a bit of a tan and I'm not willing to let my skin burn to get a natural one! So I've been using the St Tropez Gradual Tan all this week and have been loving it. I first got the full size ages ago and just didn't use it - I've not had good experiences with gradual tans in the past. But after getting a St Tropez spray tan last week, I wanted to prolong the tan for as long as possible and dug this out. I cover my hands in moisturiser to create a barrier between my hands and the tan - no orange palms! Then I applied this all over, the bottle states that only areas that are missed won't be tanned so not to worry about going over the same areas twice. This is perfect for me and I can confirm that it gives the most natural, subtle tan I've ever tried. It isn't too noticeable after one use, but stick with it and you'll have a lovely colour after 2-3 days. I got the Light-Medium one but I think the Medium-Dark would be better if you want a noticeable change after one use. I have also used this on my face (I'm not sure whether it's advisable or not but...) and it's turned out fine, only a very subtle colour change to give warmth to your face. I can't really rave about this enough! 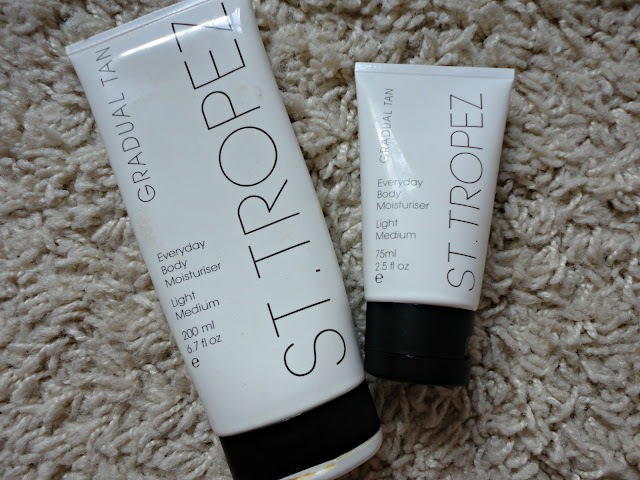 I haven't got any other St Tropez products but I really want to try the more instant tans to see if they live up to this one! Let me know if you've tried them/what you think of them.